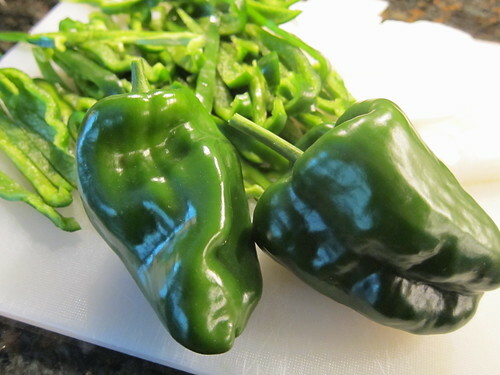 We have a bumper crop of poblano peppers growing in the garden which means one thing around our house, fajitas! Fajitas are such a simple meal. 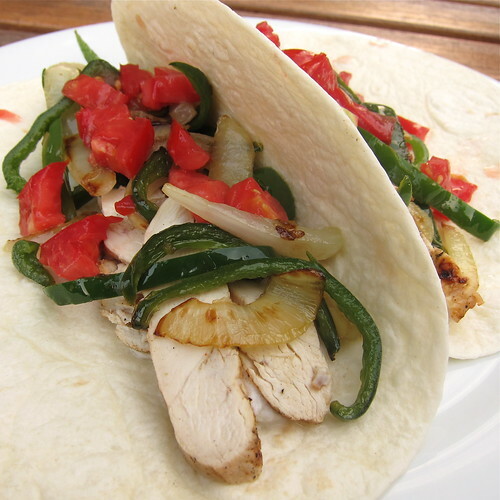 Basically, you just need a grilled meat, sautéed or grilled peppers & onions & tortillas. Other toppings after that are up to you. We like a little sour cream (well, actually plain yogurt), some fresh tomatoes & Matt likes some sliced jalapeno. For the meat we usually use beef or chicken. This time it was chicken & Matt decided to create a marinate with the flavors of a margarita. Sometimes I find you can't really distinguish the flavors of a marinade once the meat is cooked, but not so with this one. You really get the taste of tequila & lime. It was so good & fresh tasting a lot of the meat didn't even make it into the fajitas, our mouths just seemed to get in the way. Put everything but the oil into a resealable plastic bag. Seal. Shake until the salt has dissolved. Add the oil & shake to mix. Add meat to be marinated. Reseal the bag removing as much air as possible. Massage the meat a little. Refrigerate for 4 - 6 hours. Nice! Margarita-marinated meat sounds fantastic - if I make enough of the mix, this would be great for Bricken Chicken! I'm envious of your poblanos but I console myself with a vendor at the Mpls Farmers' Market. I need to pick some up for mole-making! You have such fabulous recipe ideas and I love that you are right here in the twin cities! I added your blog to a list of great sites on mine...hope that is okay! Looking forward to making the fajitas! They look delish! So delicious! I made pioneer woman's T-L chicken a little while ago and have been craving it the past few days. I'm going to have to make it again soon! Sounds like just the thing on a hot summer night, accompanied by margaritas, of course! Thanks for sharing the marinade recipe. I bet that is one tastey marinade. Planting pablanos was a good idea. Where did you get the seeds? Love that marinade. I really need to try one with tequila. I've been making fajitas with our colored bell peppers. I've not had many poblanos. Maybe I should look into growing them next year.